It's been an amazing start to the year over here in California, with nice 80 degree beach weather all week! Before you get too jealous, we are bracing ourselves for more cold weather to suffer through, which for me is anything below 70 degrees. As an iPad and iPhone owner, using my devices can become somewhat of a challenge in the winter because I wear gloves to keep my hands nice and toasty. It was getting pretty tedious having to take a glove off every time I wanted to make a phone call or look something up on my tablet. So I looked into my options. Luckily for me, we sell capacitive styluses of all shapes and sizes! For everyday use, I prefer this Keychain Extendable Capacitive Stylus because of its small and compact design. I managed to attach the stylus to the case on my iPhone, making it easy to use my phone when I need it without having to take off my gloves. It usually takes me a couple of hours in the morning to warm up before I take my gloves off. That's why I also keep my 2-in-1 Stylus and Executive Pen at my desk at work! It's very comfortable to be able to write something down in my notebook and with a flick of the wrist use my stylus to make a note on my calendar or change the song I'm listening to. My new favorite product at Accessory Genie is probably the most simple and amazing concept anyone could've thought of! 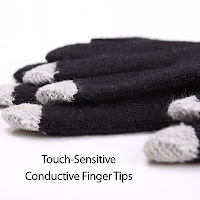 My Touch Screen Sensitive Gloves are amazing because they let me go about my normal day using my tablet and smartphone without having to take any additional steps! I have them in black, and it's also rumored that we'll soon have them in pink! Now I am definitely prepared for that 60 degree Southern California Winter weather!